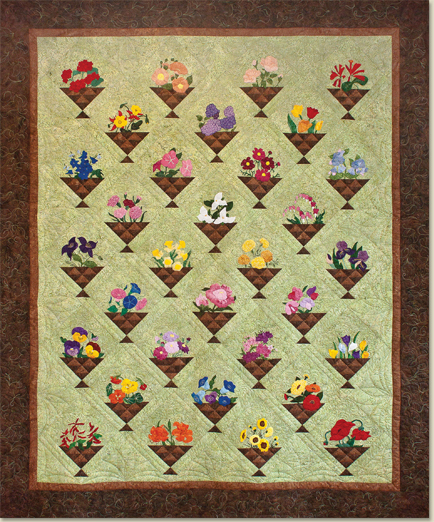 The Original Flower Basket Quilt was designed and published by Ruby Short McKim beginning in October of 1934. Carried in newspapers across the country, the series included 32 floral designs plus templates for the pieced basket and quilting suggestions. 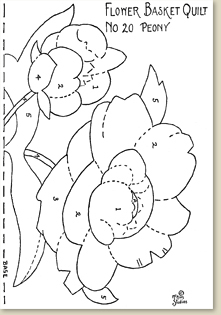 Each week’s flower pattern included suggested colors for appliqué with embroidered edges and details. The blocks were 12" square, the finished quilt was 80" x 97" including two 3" borders. 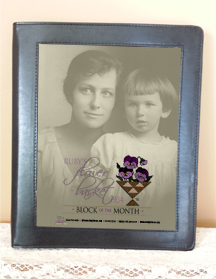 Now, 80 years later, this pattern is offered again as a block-of-the month program exclusive to independent quilt shops. So if you're an individual who wants to participate…tell your local quilt shop to sign up! 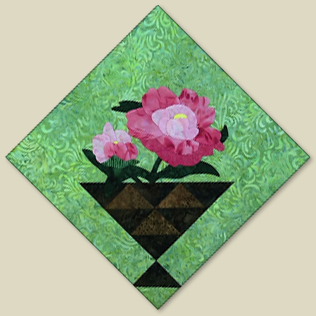 Ruby’s Flower Basket Quilt patterns have been remastered by Merrily McKim Tuohey, youngest granddaughter of Ruby Short McKim and owner of McKim Studios. 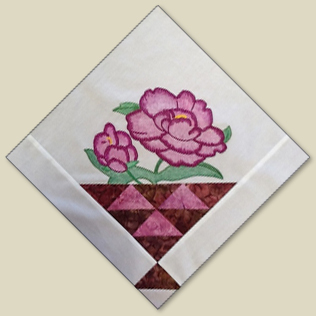 Kim Conner of Maple Grove, Minn. has updated the instructions for today’s quilters, offering instructions for embroidered flowers with a pieced basket base in addition to Ruby’s original instructions for appliqué. 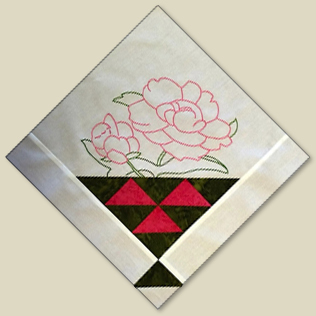 The use of crayons to color the embroidered blocks offers an additional option. There may be more handsome quilts to come, but really, so far as we have seen here is quite the loveliest one that has yet been designed! Flowers beautifully planned to appliqué in all their natural colors, quaint patchwork baskets, bits of embroidery for stems, stamens, leaf veins, etc., all combine in achieving the charm of our new Flower Basket Quilt. It’s 32 blocks set together as shown, will have the stronger colored flowers to the outer edges, circling in those of daintier hue to the center. The four corner blocks are in red, while those adjacent shade into henna, orange, apricot and tea rose tones, with blue, pink, orchid and yellow flowers balanced through the center. Each of the flower designs here shown in miniature will be published in this series exact size to copy onto your materials. Definite instructions as to tracing and applying the patterns, cutting patterns for the strips and triangles and quilting designs for the whole will all be included. Save this diagram, and each pattern as published, for they are a free gift then, but we will later have to charge 10 cents each for back numbers. Note: If you have any special inquires regarding this quilt or quilt-making in general, just write Ruby Short McKim, Quilt Editor, in charge of this paper, enclosing a self-addressed and stamped envelope, and she will answer you personally without charge. please contact your local quilt shop or one of the participating shops listed below. 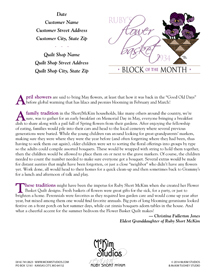 ONCE you’ve found a quilt shop to work with, we have a very special offer for you…Customized BOM Notebooks for you to keep track of and organize your Flower Basket patterns, instructions and ‘chapterettes’ of Ruby Short McKim's life story. THIS sturdy black leather notebook includes a lovely cover insert, as shown below, with fabric pockets inside the front and back for tucking in incidental information. The Title Page features a special story written by Christina Fullerton Jones, eldest granddaughter of Ruby, not published anywhere else. This page is customized just for you with your name, address, sign up date, and the quilt shop you’re working with. 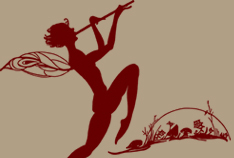 McKim Studios is hosting a Facebook Group “Ruby's Flower Basket” for ALL Flower Basket BOM customers to post photos, ask questions of each other, share ideas, etc.